WebXperts was approached by Turner Enterprises in 2006 to build a custom content management system for their current website. Turner Enterprises is the company of media mogul and icon, Ted Turner. WebXperts implemented a custom content management system into their legacy website written by another development team. Turner Enterprise chose WebXperts again to redesign their website and again integrate a custom content management system designed around how their company operated. WebXperts went to Turner Enterprises and interviewed the team members that would be using the content management system to identify the functionality that would be needed for the website and content management system. 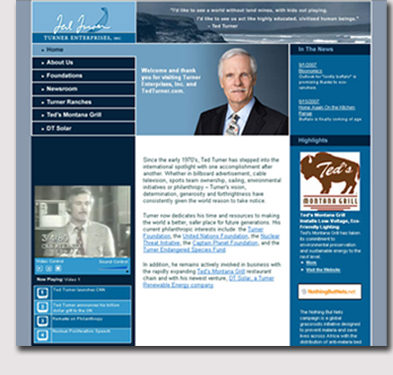 WebXperts also created a website for Ted Turner's book and hosted their website and databases from 2006 to 2012.